Meade Series 4000 Eyepieces. Illustration courtesy of Meade Instruments Corp.
Meade has had a lot of success selling their Series 4000 oculars. They advertise, in Meade's usual exaggerated fashion, that Series 4000 oculars are, "The finest in premium telescope eyepieces." (If that were true, why do they offer the more expensive Series 5000 eyepieces?) In any case, we have generally found the Series 4000 Super Plossls to be good oculars. The Series 4000 Super Plossl oculars are made with four elements in two symmetrical groups, the standard Plossl optical formula. Meade claims that their Super Plossls are computer optimized to offer excellent center to edge sharpness, a reasonably wide apparent field of view (AFOV) of around 50 degrees, decent eye relief, plus minimal astigmatism, chromatic aberration and spherical aberration. Because of their symmetrical optical layout, Plossl oculars are generally more susceptible to internal reflections when viewing bright objects at high magnification than orthoscopic oculars, which also use four elements in two groups, but arranged asymmetrically. On the other hand, Plossls offer a wider apparent field and longer eye relief. The Plossl is a good ocular design, well suited for general-purpose viewing. They are excellent for deep space viewing and for seeing faint planetary nebula. Plossls are a good choice for splitting close double stars and can provide spectacular planetary and lunar detail in good seeing conditions. They work well in all types of astronomical telescopes and when used with high quality Barlow lenses, such as the Celestron 2x Ultima Barlow and Meade 2x Apochromatic Barlow. For short focal length oculars, less than about 12 millimeters, we prefer wide-angle ocular designs with greater eye relief, such as the Celestron X-Cel LX, but in medium and long focal lengths, Plossls are a good choice. Meade's Series 4000 oculars feature seven-layer multi-coatings, edge blackened elements and fold-down rubber eyecups. 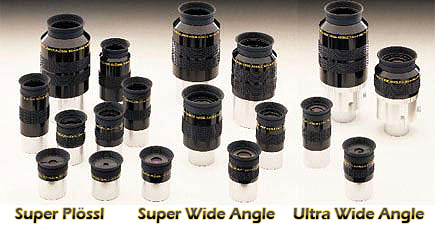 All 1.25" oculars are threaded to accept standard 1.25" filters. All Super Plossl eyepieces from 15mm on up have rubber grips and all focal lengths up to and including 32mm are parfocal. Meade Series 4000 Super Plossls are offered with 1.25" mounting barrels in focal lengths of 6.4mm, 9.7mm, 12.4mm, 15mm, 20mm, 26mm, 32mm and 40mm. In addition, there is a 56mm Super Plossl with a 2" diameter mounting barrel. In the market place, the Meade 4000 Super Plossl line competes directly with Celestron Omni Plossl and Orion Highlight Plossl oculars, as well as with the generally more expensive Tele Vue Plossl line. (Of course, other brands are also available, but the four just mentioned are major players.) The Meade Super Plossl, Celestron Omni Plossl and Orion Highlight Plossl oculars are similar in price from most retailers, so you can take your choice, regardless of the brand of telescope you are using. For example, we have used both Celestron and Meade Plossl eyepieces in both brands of scopes. We have had a fair amount of experience with the Meade 26mm Super Plossl. This Meade Series 4000 Plossl is a good ocular, sharp and clear without noticeable distortion. We like it better than the Celestron 25mm Plossl that came with the Omni XLT 102ED telescope we reviewed, because it seems a little easier to look through. However, the Celestron Plossl has about 60% longer eye relief, so it would be a better choice for eyeglass wearers. The knock on Meade products, including the Series 4000 eyepieces, is their spotty quality control and indifferent customer service. That is a bad combination, as it increases your chances of buying a new ocular with a flaw in materials or workmanship and decreases your chances of having the problem resolved promptly and successfully. Meade Series 4000 eyepieces come with a one-year warranty. As long as you don't need to use it, they are great! Copyright 2009, 2010 by chuckhawks.com. All rights reserved.